Go to CheapAir, online at cheapair.com, for the cheapest prices in flights. CheapAir is unique in offering a price drop payback. If the cost of a customer's itinerary goes down any time before the trip, CheapAir will pay the difference in the form of a travel voucher up to $100. CheapAir searches hundreds of flights with airlines like American, Virgin America, United Airlines, US Airways, Frontier, Air Canada, British Air, and dozens more to find the best deals. Plus, CheapAir.com offers discounts on hotels, cruises, and car rentals. But before you book your trip, get all the latest CheapAir.com discounts, CheapAir promotions, and CheapAir coupon codes found here at RetailSteal.com. Use this coupon code at CheapAir and save $10 on flights to New York City. Click here to save. Book your flight using CheapAir and save $10 on a flight to San Diego. Click to save. Take advantage of travel deals from CheapAir and save up to 50% or more on flights. Click here to book yours today. Save up to 50% or more on the latest Travel Deals from CheapAir.com. Click link to go to CheapAir.com and click the "Travel Deals" at bottom of the page to view the latest discounts. CheapAir.com also offers deals on hotels. Click here to book now. CheapAir.com's exclusive Price Drop Payback lets you buy airfare with confidence. If fares drop after you purchase, we'll credit you back the difference. Click here to book today. 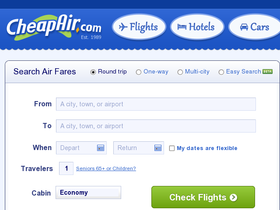 CheapAir is the online destination for low cost airfare. Click this link to book today and save on flights from Virgin America, American Airlines, United Airlines, and others. Check out the special offers at HawaiianAir.com to find deals like roundtrips to Hawaii from $318. Click link now. Use coupon code to get $25 off flights to Australia from OneTravel.com. Use coupon code to get $25 off your last minute flight purchase from OneTravel.com. Check out the last minute deals at Orbitz and save up to $100. Click link now and save. Book your flight and hotel together and save up to $465 at Orbitz.com. Click link to save. Use this coupon code to get an extra $50 off your five flight tickets purchases from OneTravel.com. Visit Orbitz.com to find round-trip airfares under $200. Click link to save. Book your ParkSleepFly.com package today and get up to 14 days of free parking! For less than some airport parking fees get a hotel room, shuttle service to the airport and parking from 7-14 days. Click link to book today. Find your textbooks at Bookbyte.com for up to 90% less than in the school bookstore. Click link to save.